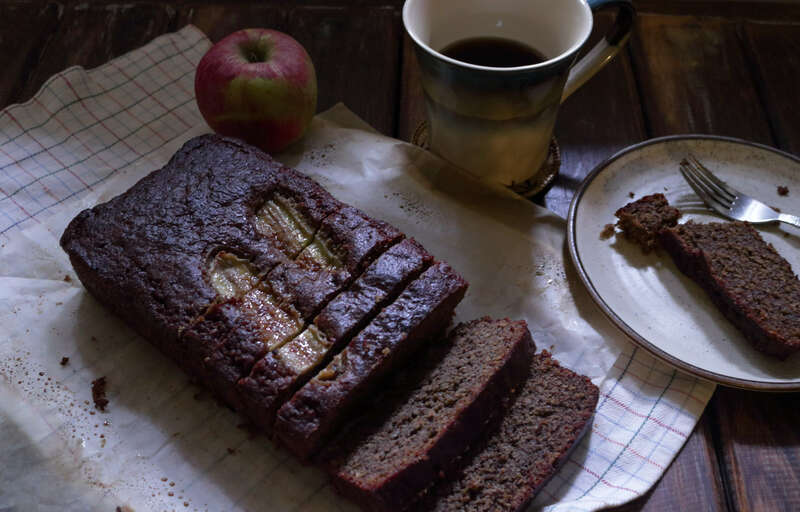 Banana and coffee meld marvelously yet hold their own in this grain-free bread. It is built with ground almonds and oatmeal with cornflour acting as the cement. 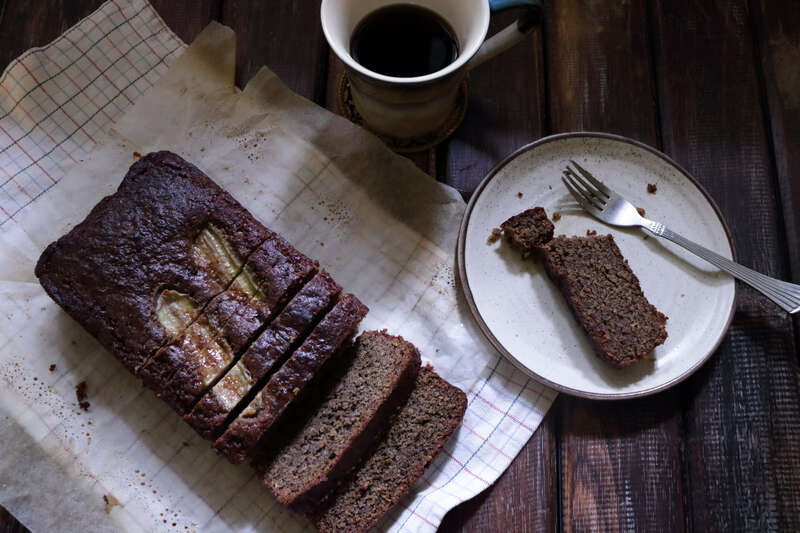 In this banana bread recipe, I’ve tried a riff on the classic and combined the vanilla sweetness of ripe bananas with the delicious and dark complexity of coffee. I even dropped the butter for fragrant, cold-pressed coconut oil. So obviously, I had more than a few apprehensions about one flavour overpowering the others or ending up up with a strange mishmash of everything, but they worked surprisingly well together. 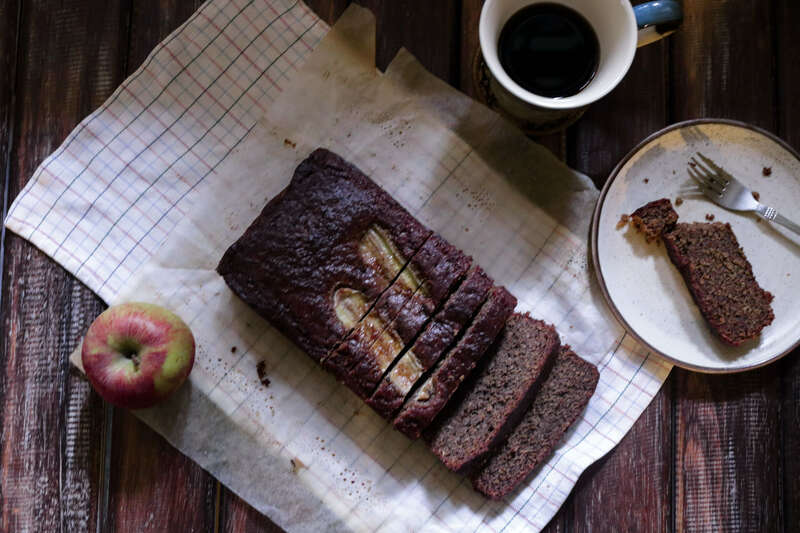 Most banana breads are very forgiving. They embrace substitutions easily and don’t make big demands of your time and effort. In turn, they fill your home with the aroma of warm hugs. While there is nothing wrong with the original, a more wholesome, healthy version was my goal. I bake banana bread often (also milkshakes and smoothies) since the hot and humid climate of my city turns bananas from ripe to squishy in a matter of hours. Bananas, right? I never buy almond flour especially because it can go rancid very quickly. I mill fresh almond meal whenever I need. And for sturdy loaves like banana bread, I don’t even blanch and peel the almonds; just lightly toast them so that they don’t clump in the processor (while toasting, don’t let them turn even slightly brown), cool and then whizz till they resemble fine breadcrumbs. Same with the oats – rolled oats powdered in the processor are my staple. In fact, if you like a chewy texture, leave them a little coarse. Almond meal, oatmeal and cornflour do a great job drinking up the moist essences of coffee, banana and coconut oil. And, unlike the flat texture of AP or plain flour, yield, a plump crumb with chew and bite. My banana bread you’ll notice has the dark colour of molasses. That’s the brown sugar at work. Brown sugar is a natural ally for bitter coffee in my view, but you could just as easily go for granulated sugar or even honey. Maple syrup if you can lay your hands on some. 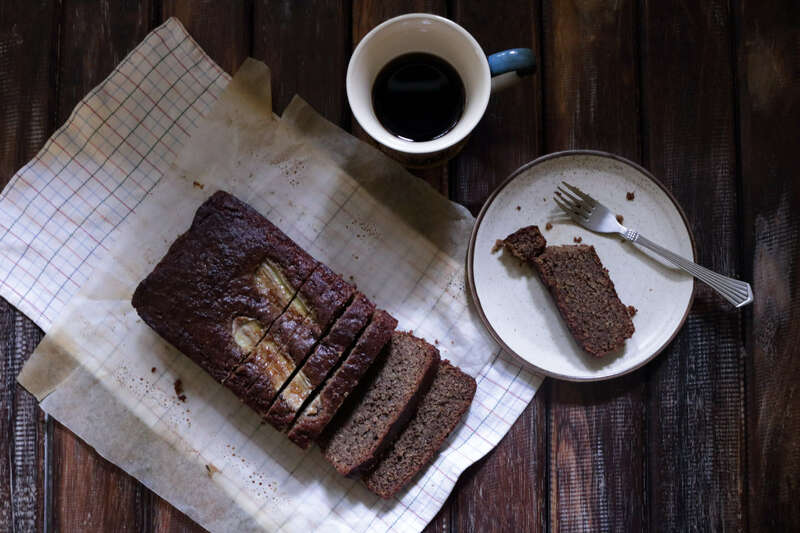 And if you don’t have any of these things at home, you could very easily bake banana bread with this very same recipe using all-purpose flour. Chuck in some walnuts, seeds or raisins or a little bit of everything if you like; play with it. And have fun. Preheat your oven to 180℃, line a 9-inch loaf pan with lightly greased parchment (leave some overhanging parchment ; it helps to lift the still-warm bread out). In another bowl, whisk together the eggs, coconut oil, coffee and mashed bananas. Fold in the dry ingredients until just combined (do not overmix or the soda bicarb will go flat and the bread will not rise) and pour into the prepared pan. Bake for 30-45 minutes or till a skewer inserted into the centre of the loaf comes out clean. Remove and cool completely on a wire rack before slicing. This coffee cake looks utterly delicious! Can we replace the egg with flaxseed powder? I’m sure you can. Make sure to soak the flaxseed powder in water for 15 minutes before you add it to the cake batter. You can replace 1 egg with 1 tablespoon of flaxseed powder. Let me know how it turns out.